When Google says jump, the web designers ask how high. Sometimes that is good; sometimes a quirk in the ranking algorithm causes web designers to re-tool their pages in the most stupid way imaginable in the quest for an edge over the competition. Yesterday it was made-for AdSense pages with no content except a ton of AdSense ads. 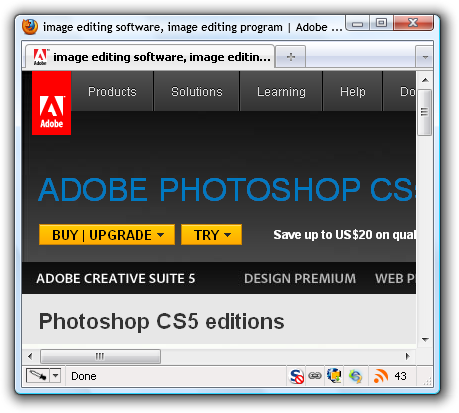 Screenshot of the Photoshop CS5 product page[c]. Couldn't Adobe at least put "Photoshop CS5" in the title? Perhaps is gives some more clicks, but it sure isn't good design having those keywords there like the droppings of some mythological rat SEO. Google's goal is to be un-game-able, meaning that if the content is good, you rise to the top - if not, you don't. Therefore their webmaster guidelines have been very focused on not doing things just for the Googlebot[d]. These title keywords are a small taste of what we can expect if Google drops that policy. Thank God, Apple isn't showing off their iPhone[e] on a page titled phone, smart phone, calls, messages, mobile video, iphone, eye phone, fone | Apple . But then, they do get this "design" thing.